Plastic was all over the catwalks during the latest men's edition of London Fashion Week, but not everyone had the environment in mind. We look at five examples, with some labels using virgin plastic and others opting for recycled. The use of plastic is a key issue in the design industry right now, as the world wakes up to the effects that plastic pollution is having on the earth. While manufacture of single-use plastics is under heavy scrutiny – many government bodies, plus big companies like IKEA and The Guardian, have pledged to either ban or reduce their use – virgin plastic is still common. Virgin plastic is any new plastic that is being manufactured for first use, whether recyclable or not. During London Fashion Week Men's Autumn Winter 2019, which took place from 5 to 7 January, the material featured heavily. British labels Craig Green and A Cold Wall both presented plastic-heavy looks made from virgin plastic, as did Stefan Cooke, who is part of non-profit initiative Fashion East. Cooke said the key to minimising the negative effects of using plastic in fashion is by creating products that will endure, as an alternative to fast fashion. "In terms of fashion design, and especially with our own collections, if we are using plastics we will make sure the product we are making it from is as good quality as possible so the piece is used for years," he told Dezeen. "We need to evolve or die"
In contrast, London-based Raeburn chose materials made from recycled bottles and reclaimed parachute nylon for its collection. The brand said it believes using recycled plastic is the only option. "We need to evolve or die," it said. "Plastic waste, Blue Planet Two and UN Climate Change reports are shaking us from our weary slumber." New York-based menswear label Private Policy was another that showcased virgin plastic, but said it is actively exploring how it can be more responsible. "The plastic vinyl is not a recycled material but we have been looking into a recycled polyknit fabric which we plan to make into a sporty jersey for the Spring Summer season," it explained. New York-based menswear label Private Policy sent models down the runway wearing clear vinyl sleeves underneath their T-shirts. "It is soft clear vinyl, a styling piece meant to be for the catwalk show only," said the brand. The label led by British designer Christopher Raeburn presented a selection of zipped over-shirts and relaxed trousers . The plastic material used was created from recycled bottles and reclaimed parachute nylon. British designer Craig Green presented "men made of glass" – a selection of brightly-coloured looks made from densely smocked sheets of plastic. Six models walked down the catwalk wearing outfits made from polyethylene plastic, commonly used for bin bags, with billowing capes. Each entire outfit was a single colour, in red, pink, aqua, yellow, ultramarine and neon green. As well as the capes, models wore matching headpieces made with the same smocking technique, which covered their faces. 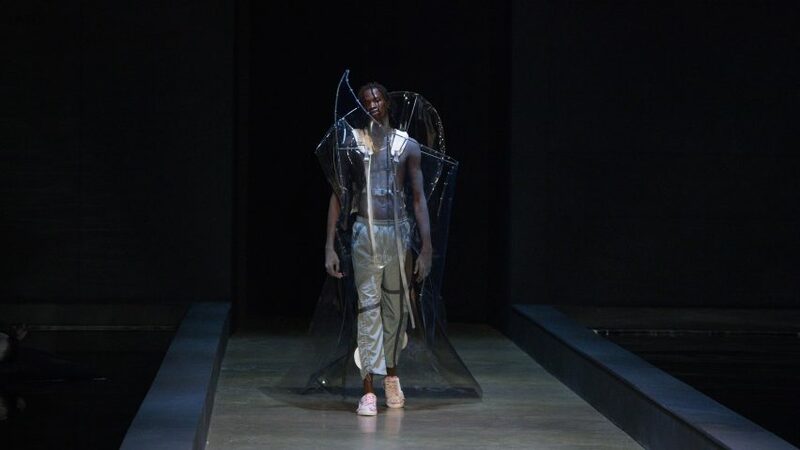 A deconstructed bodice made of jagged, protruding shapes was the centrepiece of menswear designer Samuel Ross' collection for his brand A Cold Wall. The abstract forms, which were attached to a neutral-toned harness, curved around the model's body, pointing out in different directions. The British designer crafted the conceptual garment from a combination of welded steel and non-recycled PVC plastic. Stefan Cooke – who is a part of non-profit initiative Fashion East – created a series of small transparent handbags made of vacuum-formed, hard plastic. The designer does however encourage a responsible approach to plastic use, with a focus on quality products instead of fast fashion.